'Think about it deeply -- about the move and the reactions it has gathered -- and we will actually learn a lot about ourselves,' says Sreehari Nair. The chaos of a retreating autumn playing out. There was not a sweat in the air, but a general feeling that something terrible was about to happen. The sun was low in the sky; you couldn't blame the weather for not playing it cool. A sparrow on the tree above shifted from foot to foot, staring down at the two serpentine queues. I was standing in one of the two, with one eye trained on the lines and the other on the sparrow. People could be heard muttering fervent prayers -- the kind usually reserved for instances such as the hospitalisation of a dear one -- toward successfully completing this relatively trivial pursuit. Personally speaking, this was my 3rd attempt in the day, of queuing up in front of an ATM, but I was uncharacteristically numb. The big consolation was that I was sharing my misery with those hundred odd souls in my immediate environment. My number of failed attempts paled in comparison to what most others had to offer; some of whom had made 7, 10 and -- what now rings like an exaggeration -- 13 unsuccessful tries at getting past the cash-dispensing machines! We talked about it, crossing our arms across our chests, our legs jiggling slightly in anticipation. Second in line outside the ATM entrance door now, I see a man swipe his card for cash, his black T-shirt hanging halfway over his paunch. We had been told by those previously stepping out: "Only Rs 2,000 per card allowed." I now recall that there was no triumph in those voices -- only a messenger's matter-of-fact sparseness. The text on the paunchy man's T-shirt reads THIS IS IT! and it takes on ominous tones as he swipes his card thrice, and peers despondently at us waiting outside. The subsequent violent shaking of heads, create a Mexican Wave of distress through the queue and the word spreads almost wordlessly, "We are out of Cash." The man with 13 unsuccessful attempts against his name, sighs and increments his counter. The sympathising janitor at the door informs us that the cash-dispensing machine had been refilled four times in the last 24 hours, implying effectively that no more replenishment must be expected. By then the second ATM too had run out of breath. Mumblings take over the scene. What seemed like a revolution three days back was now fast losing its teeth. A mother explains to her precocious little daughter that ATM stands for Automated Teller Machine and not Any Time Money. The term 'Acche Din' is tipped out, with a note of sarcasm. The crowd disperses. Back in my office, earlier in the day, a colleague sounded stentorian: "I am ready to face all the hardships that this demonetisation may bring about, as long as it benefits common men like me." This particular Common Man colleague happens to earn Rs 150,000 plus every month. 'The natural state for the common man is anxiety,' Cummings had once pronounced. I tallied my colleague's hope with the hopes of all those other common men who stood with me in the queues that day. Even to the most cynical of that lot, the momentary disappointment outside the ATM booths seemed like an investment which held in its gullet, some tangible benefits for the future. To many of those, this was the third act in the whole Corrupt Politicians versus Noble Citizens narrative that they had been constructing in their heads for some time. The denouement was near. Their commonness was about to be rewarded. The common man is, of course, anxious about money, security, and God, but most of all, he is anxious about his own position as the Common Man. 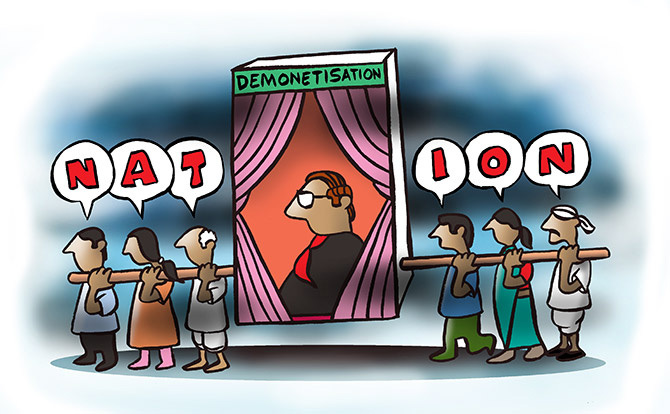 Attention, all those Common Men waiting to make capital off this demonetisation process: Are you up for a thought experiment? What if this whole ritual of standing in long queues and being denied money just inches away from the machine, what if something as unglamorous and unsexy as that, was your only chance of contributing toward Nation Building? We, of course, have an idea of Nation Building derived from the slickness of action movies (Nayak!) but what if true Nation Building occurs in ways that aren't half as interesting as that? The Capital-T Truth (putting aside, for a moment, the splendid goal of bringing black money hoarders to book) is that a lot of the social and political corrections that had to happen in India could only have happened courtesy some minor cataclysm like this one, which disrupts the comfort of our everyday lives. The painful reality is that we were having it very easy, materially as a nation, for a long time now, to truly care about Nation Building beyond polemics. And this reality was harming us in more ways than one. This move, though trotted out with a tagline of being the Ultimate Fight against Corruption, has helped us understand what pulling together through tough times actually means. Beyond uniting in polemics, we are making small concessions upon each other. We now trust each other more in the simple semantics of everyday life. And if I maybe deliberately fancy, the last week or so, has taught an entire generation wedded to iPhones and Shopping Malls, what standing outside a ration office for your monthly quota of kerosene once felt like. The ruminations don't end there; because we haven't discussed the poetically sad part yet. And here it goes. So what if all this forfeiting of comforts, this meshugas, this having to put off all your elaborate purchases, incurring debts, and not having cash to even pay your doctor, what if all the hardships arising out of this demonetisation process, were to yield you no perceptible benefits whatsoever? Would the Common Man then consider this jolting move, a failed experiment? It is here that the Common Man must perhaps pause and remind himself of something he often glosses over: That this is largely a country of men more common than him. For anyone expecting a big haul in return for your efforts, it wouldn't hurt to reconcile with the simple fact that it is those more common men, and not you specifically, who stand to become the true beneficiaries of all this sweat and blood you are pouring out on the urban streets. It will take more than just a few broken hearts, and more than some petty grumblings to realise that this grand-sounding Nation Building exercise when carried out in a country like India would result in change so removed from where you are as to make any direct sense of it; and it would be too unsophisticated and random to be charted out on a Power-Point Presentation. Was it done in haste? Was it planned well in advance? -- is that you miss some of the spiritual implications of it. As citizens of this country, we often expect sweeping changes here, but find the smallest of abdications that we may ourselves be called upon to make far too inconveniencing. Think about it deeply -- about the move and the reactions it has gathered -- and we will actually learn a lot about ourselves. If you do think about it deeply it also explains why many of our firebrand non-political crusaders go onto become such ineffective political leaders. Simply put, why can't we see a minor sacrifice of our material comforts, as a sacrifice at the altar of Nation Building? In the absence of such an attitude, can we expect our politicians to strive hard toward keeping the nation above their own personal interests? What kind of political and social future does all of this foreshadow?